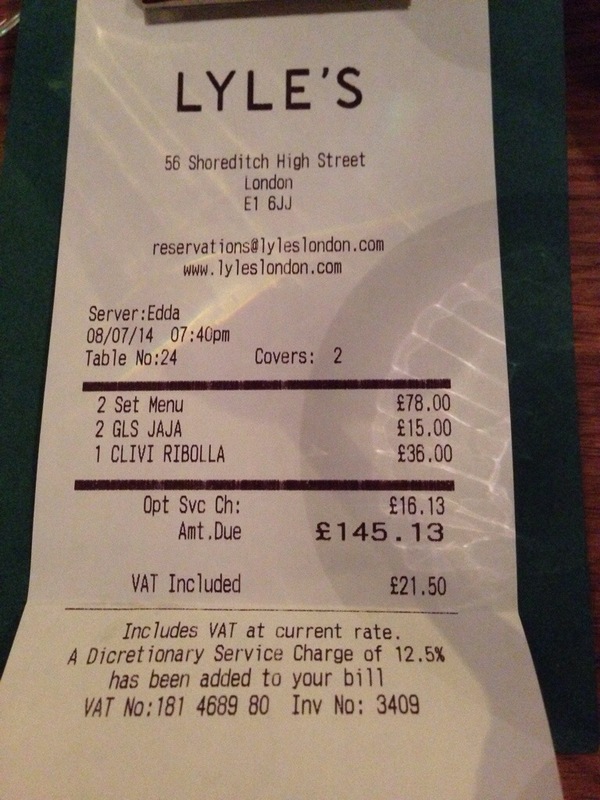 Home » ★★★★☆ » Lyle’s. Golden. It seems to rain every time I travel East to eat. I don’t know what it is, maybe the weather is trying to tell me something i.e. I am out of my natural habitat. I worked in the City for 10 years. It felt like a life sentence. My heart still sinks when I get to Bank Station. Last time, I booked The Clove Club on Valentine’s Day. Stupid mistake. I don’t really do Valentine’s day so I failed to register the 14th February date, when booking on Opentable. I should have wondered why a table was available at this most-difficult-to-book of restaurants. And why it was more expensive than usual. C and I practically paddled from Liverpool Street to Shoreditch Town Hall, where we proceeded to sit in damp dripping clothing, surrounded by loved-up young couples. A brief sojourn into the sheer hell that is a contrived festivity, combined with a biblical downpour, I feel that we did not experience The Clove Club at its very best. You will note that there is no review. And round the corner from The Clove Club is this gem. The chef, James Lowe, like Isaac McHale at The Clove Club, was previously part of a group of chefs called The Young Turks and did a stint at St John Bread & Wine. The St John influence is clear – this is the closest I have come to St John without actually being in it, although the food is slightly more complicated. It’s not part of St John but, interestingly, is owned by the same group as Trishna and Gymkhana. It’s a tangled old world, restaurant ownership. 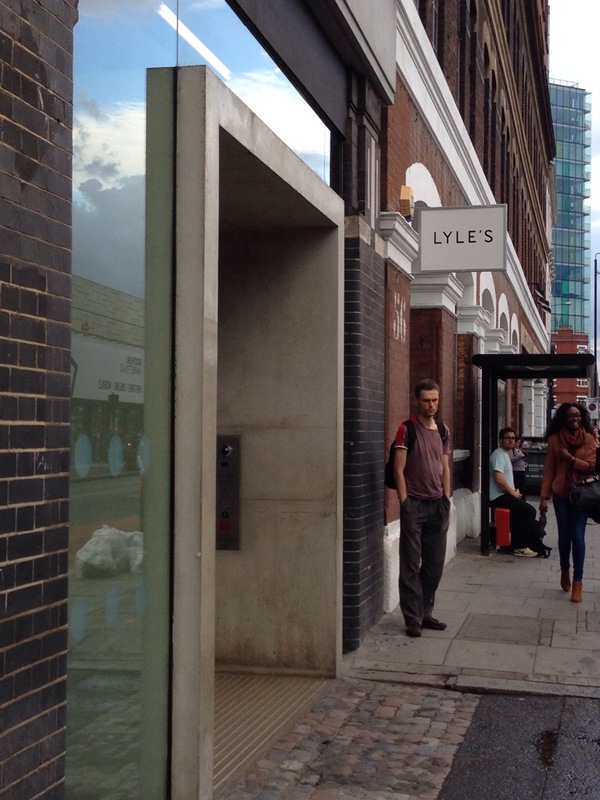 Lyle’s does have a number of Shoreditch restaurant essentials: pale wood furniture, Ercol I guess, envy-inducing Crittal windows, white walls, industrial lamps and a polished concrete floor, all the hipster signifiers. Not that I’m complaining, mind, it’s a style I like and would very much wish to introduce into my own working environment. Chances? Nil. Shoreditch. Who could have known, all those years ago, that it would become so desirable. I lived in Stoke Newington, up the road, through now uber-hip Dalston, when it wasn’t up and coming, it was just cheap. Church Street loved itself, but who was it kidding? My father actually cried when he saw my first flat. Which was nice. Coming from the North Manchester suburbs, he couldn’t understand why I didn’t want to live in Hampstead. He didn’t quite get the nuances of the London property market. I don’t think that we’d quite taken on board that it was a set menu in the evening and there was that moment of disappointment, which dissipated fairly quickly after a glass of wine and a look at the menu. Other than a dish containing snails (I just can’t) everything else looked like something I might order, were I given the choice. But first there was wine to taste (my companion F writes about wine, so I was very happy to relinquish choice in that too) and superb bread to hoover into my face. Bread of quality, bread of crust, bread of heaven, this was a good start. 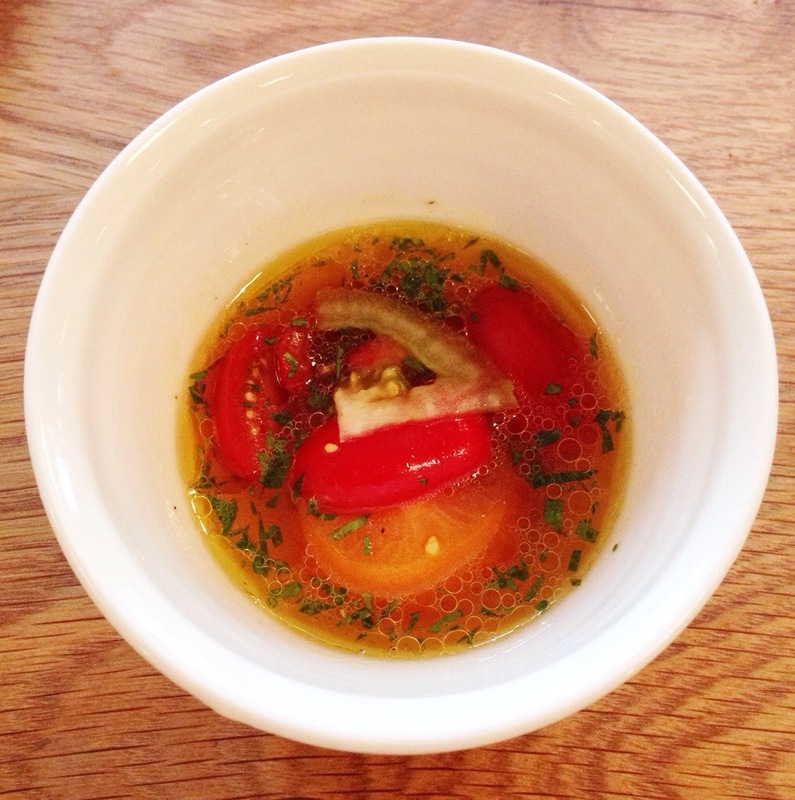 And then a series of dishes starting with a simple “soup” of tomatoes, with lovage. Tasty and delicate, I could and did dip the bread into the stock. 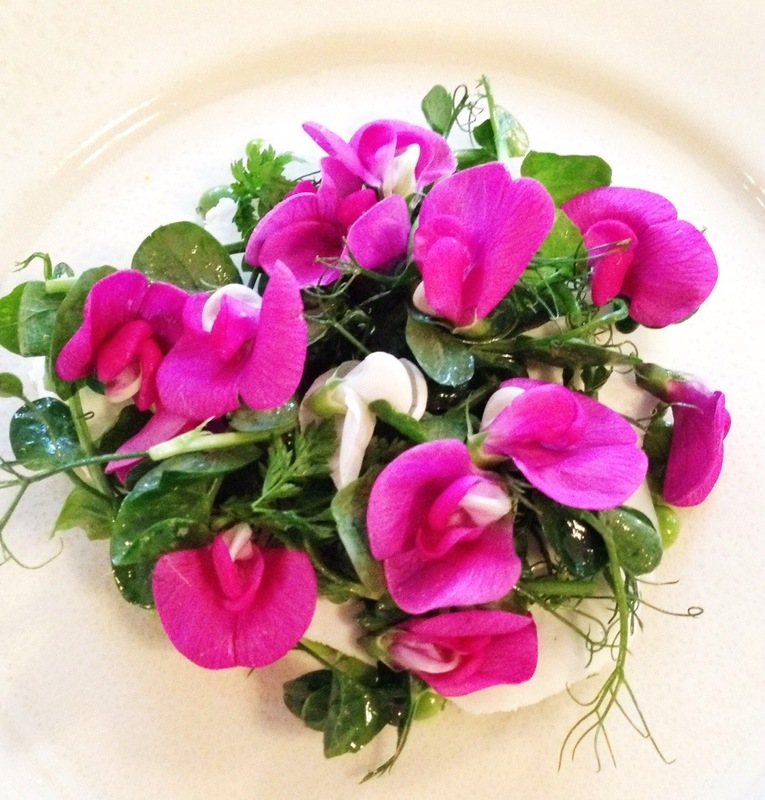 We both oohed and aahed at the next dish: prettiness on a plate as sweet pea flowers and pea shoots were strewn on top of thinly sliced Ticklemore, a crumbly, subtle goats’ cheese and underneath, the freshest peas I’ve ever tasted outside a garden. 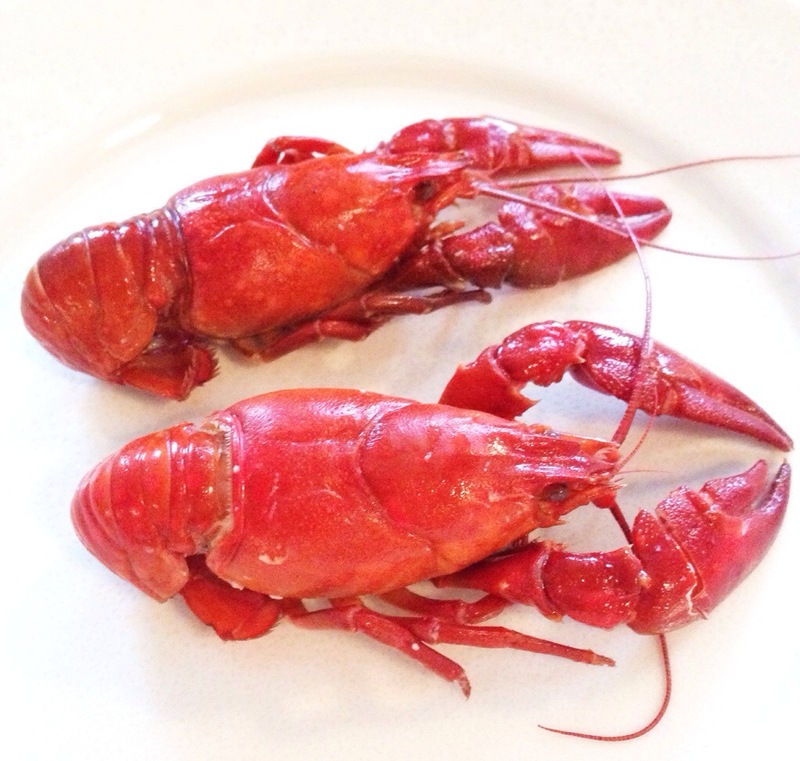 An extra : sweet, firm langoustines, with a side of runny mayonnaise, sprinkled with fennel pollen, a combination new to me but one which really worked. Then, sliced puffball mushroom, char-grilled, like a sort of spongy sandwich, with girolles replacing the dread snails and a slow-cooked egg hidden below. We had been a little worried about the description of slow-cooked egg and sought reassurance from the waiter that we were not going to see that gelatinous slime of sous-vide egg-white on our plates. He was clearly revolted by the very idea and we were duly comforted. And then, a tranche of Middle White Pork, tender, fatty, tasty, with crunchy skin and burnt onions on the side and a pork gravy. 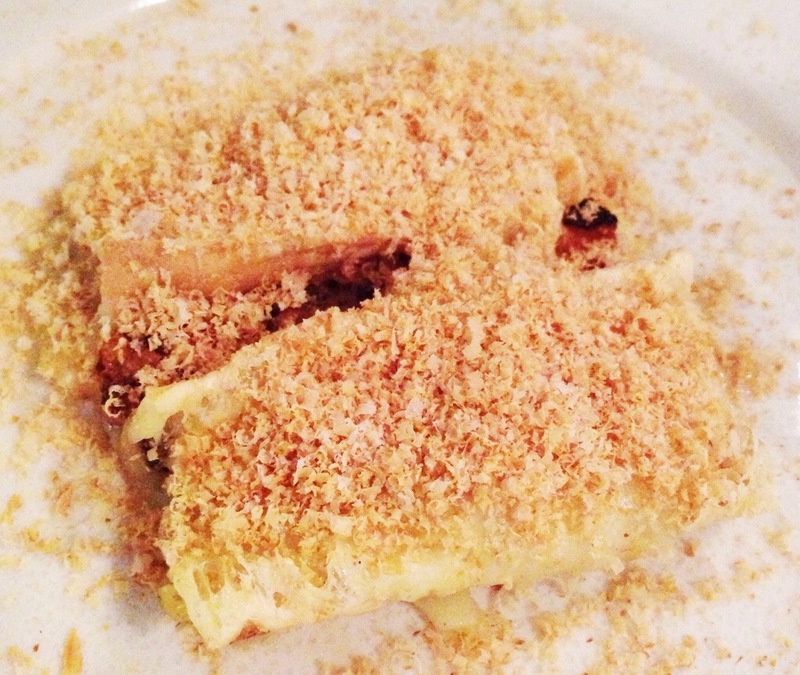 And after that, the Shoreditch version of a cheese course. St James, a mild, melted sheeps’ cheese from Cumbria, made by an artisan producer, natch, on a bed of drizzled honey topped with shaved hazelnuts, this just melted in the mouth. 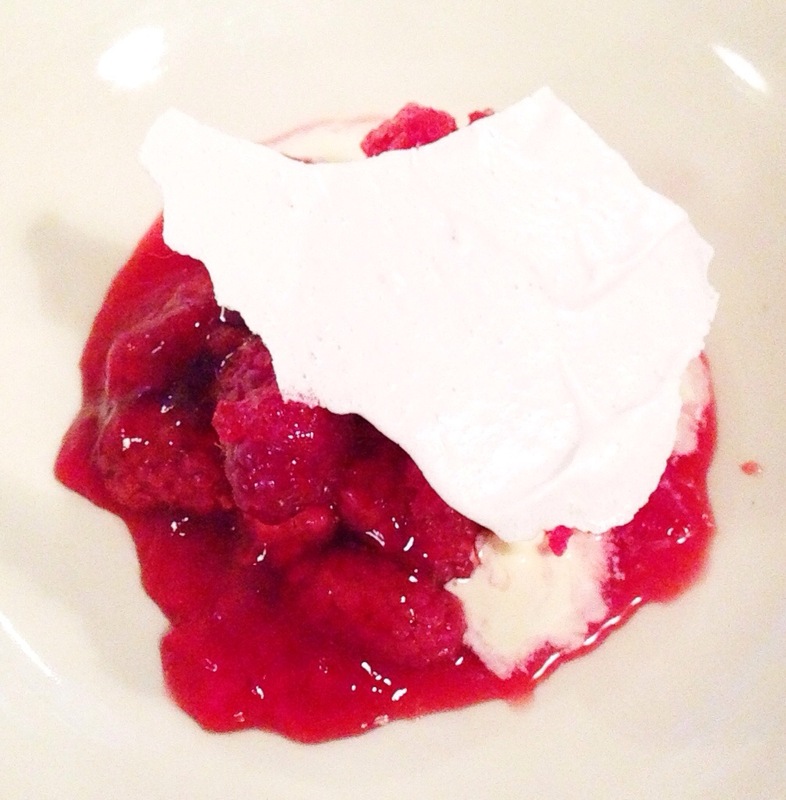 And loganberries came with vanilla ice cream and what was described as vinegar meringue – my meringue always has vinegar in it, but this had distinct vinegar taste, possibly in the juice as well, an unexpected flavour next to the just- tart-enough berries. This isn’t for everyone: the mixed reviews are testament to that and it’s always going to be a lucky dip in the evening, especially with the ever-changing menu, but I really liked it. 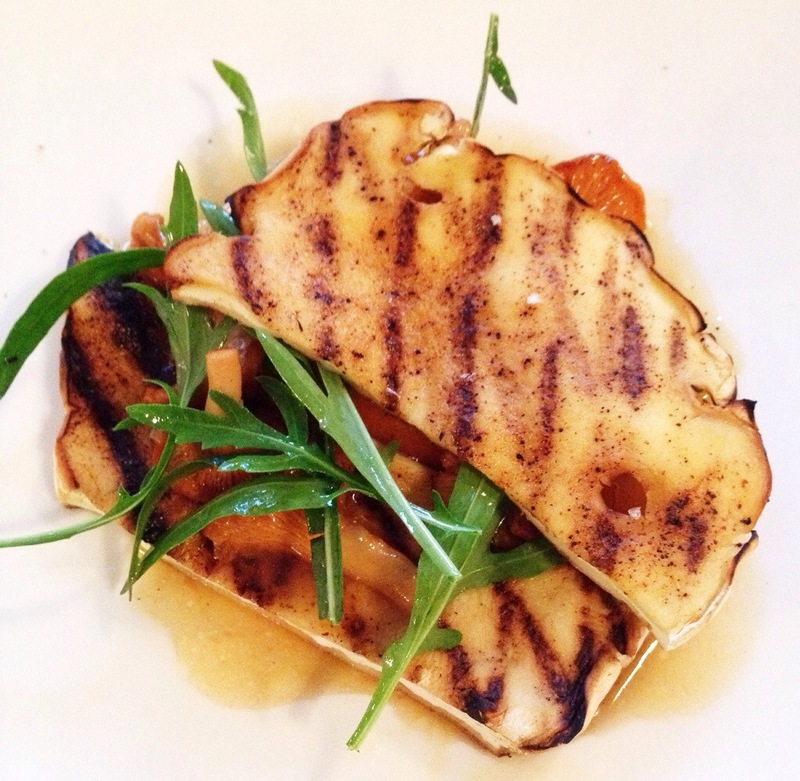 Simple, seasonal and just the right side of foodie-hipster the food was inventive, surprising and unconventional, without being challenging. And tip – Austrian wines: they’re a thing. Tomatoes. But so much more . Loganberry and vinegar meringue. Tarty.